Day 7 – Leaving Trinity Beach and flying over the Great Barrier Reef! So the time had come for us to leave our Igloo and jump on the bus to Cairns. We checked into our hotel – The Pacific Hotel, and then we were back out again, getting picked up for my favourite trip of the holiday, our flight over the Great Barrier Reef with GSL Aviation. Arriving at the airport, we were given a short safety briefing and then taken out to our little plane, and it was little – seating only 7 of us, with myself getting to ride shotgun with the Pilot!!! It was one hell of a bumpy ride up and back down again, but boy it was amazing! It was one of the best experiences I have ever had. Yes, I felt quite sick up there, but I managed to hold myself together enough to take in those magnificent views and take some great pictures! We weren’t up in the skies for too long, and just as we were coming into land the lady behind me, who was in the early stages of pregnancy, threw up! The poor thing! Luckily, within a few minutes we landed and she could get some fresh air. My sister in turn, turned round and said ‘I hope you managed to take some pictures as I was too busy concentrating on not being sick’! This had to be one of the most memorable trips I did in Australia, and one I will never forget. That evening we decided to have a wander around the night market, and grab some souvenirs and a bite to eat, and sat by the sea just chilling and listening to the bats! Cairns is a really cool, laid back kinda place, and I loved the outside swimming pool, and the barbecue areas, where you could just rock up cook your food on the barbie and chill out with the sea in view! What an awesome way of life! Day 8 – Barefoot Tour of the Atherton Tablelands! Another early start, another tour! We sure did pack alot into our trip! 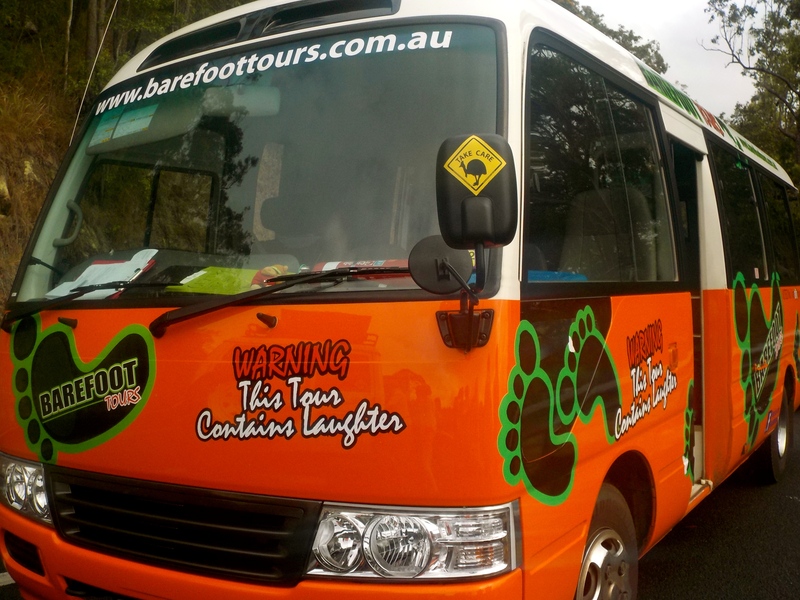 Our Barefoot Tour bus turned up bright and early, with our tour guide, who was full of energy and I could tell that this was going to be a good day! We set off around the area to collect the rest of the group, all of whom were mighty young and all backpacking around Oz! I was very envious of their tour itinerary’s! The journey consisted of us all getting to know one another with introductions and little facts about us. The journey to our first stop was around 1 hour and when we arrived we were all encouraged to have a swim in the Lake (Lake Eacham), which was the main attraction at our stop-off. I ummed and ahhed about whether I was going to go in the water, but soon felt like the odd-one out when everyone else was swimming in the cold, clear waters! So in I got! It wasn’t as bad as I thought, it was cold, but you soon got used to it, but swimming in lakes, seas and any other wild water, does freak me out, so it wasn’t long before I was back on dry land, grabbing myself a cup of tea and some fruit for breakie! The rest of the day involved hunting for tree kangaroos at a Tea Plantation, avoiding the downpours which were frequently gracing us with their presence, grabbing lunch at a little town and heading to a variety of waterfalls and nature spots! Amongst them was the famous Millaa Millaa Falls, which was the scene for that Timotei advert with the hair flick! Being the big wuss I am and the fact that the water looked pretty cold and it was in fact very wet anyway, I didn’t go into the waterfall. I really must get over this stupid fear of outdoor water! 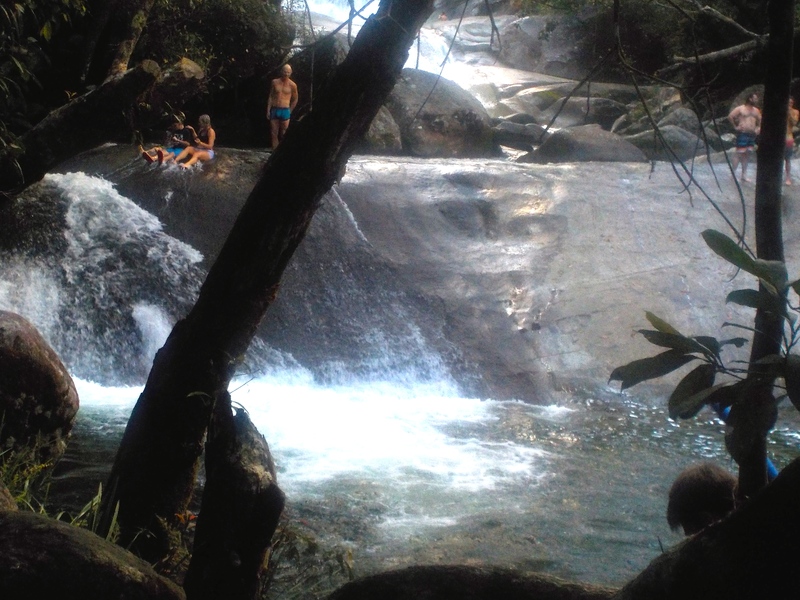 We also stopped at another waterfall call Josephine Falls, again stayed on the banks and watched everyone else have fun, or what they called fun! The day was rounded off with a nice hot drink and some Tim Tams!!! A short drive back, through the countryside and we were back at the hotel, quite exhausted, but ready for dinner! This was our first free days since we arrived in Cairns and we took our time to explore the area, do a bit of shopping and grab some lunch. It was another wet day in Cairns, but we made the most of the time we had there. In the evening, we headed back to the night market, grabbed some more food and chilled out on the front again, making the most of the views. Day 10 – Leaving Cairns to go to Sydney! Although we were quite sad to be leaving Cairns and its laid back vibe, we knew we had so much more fun to come in Sydney! We checked-out of the hotel, got in a taxi and headed to the airport to catch our 3 hour plane to Sydney! I will definitely be going back to Cairns in the future, hopefully having conquered my fear of the open water and do some diving in the Great Barrier Reef! Have any of you explored this wonderful part of Oz? !